Arakel of Tabriz’s monumental Book of History is one of the most important primary sources on the history of Armenia, Persia, the Ottoman Empire and Georgia in the seventeenth century. It covers the period from 1602 to 1666, encompassing the reigns of Safavid shahs Abbas I, Safi, and Abbas II. 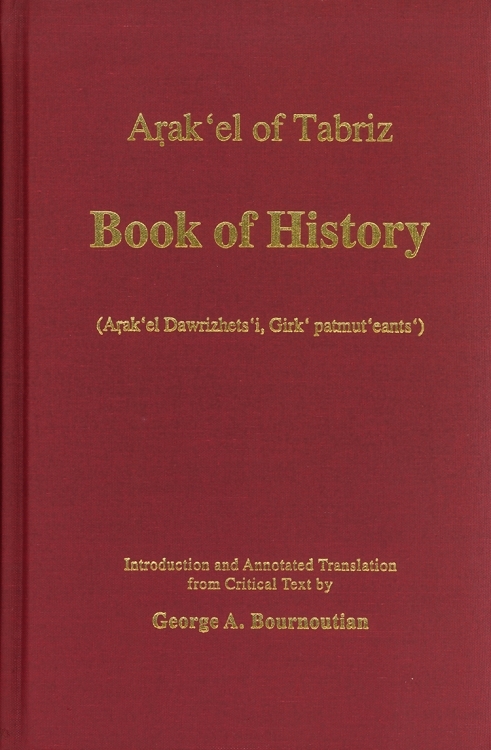 Book of History is the most complete account of the forced deportations of thousands of Armenians from their native land into Persia; of the socioeconomic conditions of Armenians in Persia and eastern Armenia; of the Celali uprisings and their effect on the inhabitants of Western Armenia; of the decline of the Holy See of Etchmiadzin under Catholicoi Davit and Melkiset and its revival under Catholicoi Movses and Pilippos; of the establishment of monastic schools in eastern Armenia; of the biographies and martyrdom of famed clerics and laypeople; of the demise of the Armenian community of Poland during the Counter-Reformation; of the genealogy of Ottoman and Safavid monarchs; of records of earthquakes, fires and eclipses; of the account of the false Jewish messiah Sabbatai Sevi in Izmir; of the order of succession of the Armenian Catholicoi; of the names and properties of gemstones according to medieval Arab tradition; of the history of the Aghuank region; and of the chronology of significant events occurring in Armenia, Persia, the Ottoman Empire, and Georgia between 561 to 1666. This English translation will enable scholars unfamiliar with classical Armenian or the Persian, Arabic, and Ottoman Turkish terminology used by Arakel to better understand the political, social, and economic history of Armenia, Persia, the Ottoman Empire and Georgia during this crucial period.